How to Export EDB, PST and OST Data to Office 365? Organizations are switching over to cloud services like Office 365 in large numbers as it provides all essential business productivity applications at one place without any requirement to deploy an expensive infrastructure. The Office 365 cloud platform helps them achieve better business performance and growth while leaving the entire responsibility of its maintenance on Microsoft. The subscription plans designed by Microsoft suit the requirements of all types of organizations and are affordable too. All these reasons explain why small and mid-sized organizations largely are adopting or migrating to Office 365. How to move existing email data to Office 365 (Exchange Online)? To ensure continuity of business operations and email communication, it is necessary for organizations to export existing email data to Office 365. In this blog, methods to export data from EDB, PST and OST file to Office 365 are discussed as most of the enterprises have Exchange Server or Outlook as their main emailing application. 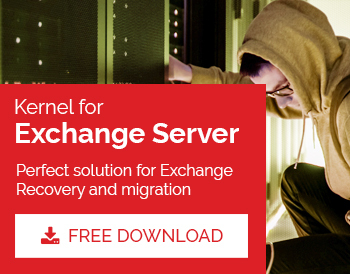 Alternately, organizations can rely on user-friendly third-party tools (like Kernel for Exchange Server) for faster and hassle-free mailbox migration. Which method to choose for Exchange to Office 365 migration? For small organizations, cutover Migration process is the recommended method of migration. It helps them migrate up to 2000 mailboxes from Exchange 2003, 2007, 2010, 2013 versions to Office 365 (but for best results, migrating up to 150 mailboxes is recommended). Also, it is the easiest among all the migration methods. In Staged migration, mailboxes are migrated in batches. It is recommended when the organization has more than 2000 mailboxes and is running an older version of exchange (2003/2007). Hybrid migration is suggested when the organization want to maintain and manage both on-promises and off-premises setups for some period, and want to migrate gradually from Exchange 2010/2013 to Office 365. STEP 1: Prepare servers and create empty security groups (mail-enabled) in Office 365. STEP 2: Verify your on-premises domain with your Office 365 account to ensure that you own the domain. STEP 3: Establish connection between the Office 365 account and the existing email system. STEP 4: Create a migration batch to export EDB files in single migration cycle. STEP 5: Initiate the cutover migration process and then route your emails on Office 365. STEP 6: After routing the emails on office 365, delete the cutover migration batch. STEP 7: Assign license to Office 365 users for the exported accounts. Aforementioned process appears simple, but it is. A silly mistake during the process can lead issues. Therefore, it is better to install a third party EDB to Office 365 conversion tool like Kernel for Exchange Server for flawless migration. STEP 1: Install Azure AzCopy tool by Microsoft. STEP 2: Copy the Shared Access Signature URL (SAS URL). STEP 3: Import PST files in Azure location in cloud using AzCopy.exe. STEP 4: Use Microsoft Azure Storage Explorer to view the list of uploaded PST files. STEP 5: Create CSV file defining the PST mailboxes to be exported. STEP 6: Create an import job in Office 365 and import PST files using CSV files. These steps are complex and require technical training for successful accomplishment, which is why experts recommend third party option for PST to Office 365 migration. Tools such as Kernel Import PST to Office 365 makes Office 365 migration simple and easy. It imports PST files to Office 365. Also, it makes the process quick and convenient for all types of users. STEP 1: Open MS Outlook and click on File menu. STEP 2: Select Export to a file option and click Next button. STEP 4: Select the OST folder which is required to be converted and check include subfolders option. STEP 5: Define the saving location for the converted file and click on Finish button. Following the above process user can obtain the required OST file in PST file format and thereafter perform manual PST to Office 365 migration process as discussed above in order to relocate the selected OST files to Office 365. However, it has already been discussed that the manual process might create complication. So, the user must acquire a third-party tool which can save user's time effort. Import PST to Office 365 is one such tool that can simplify the entire OST to Office 365 migration process. From the above discussion, it can be concluded that manual Office 365 migration process for various file types (EDB/PST/OST) can be substituted by third party tools to make the migration quick and easy. Employment of third party EDB to PST tool has advantages for the organizations in terms of time, money and efforts. Moreover, third party tools can be operated even by non-technical people.